Tonight Layla was inspired to make quiches and tarts, so she baked 4 of them. 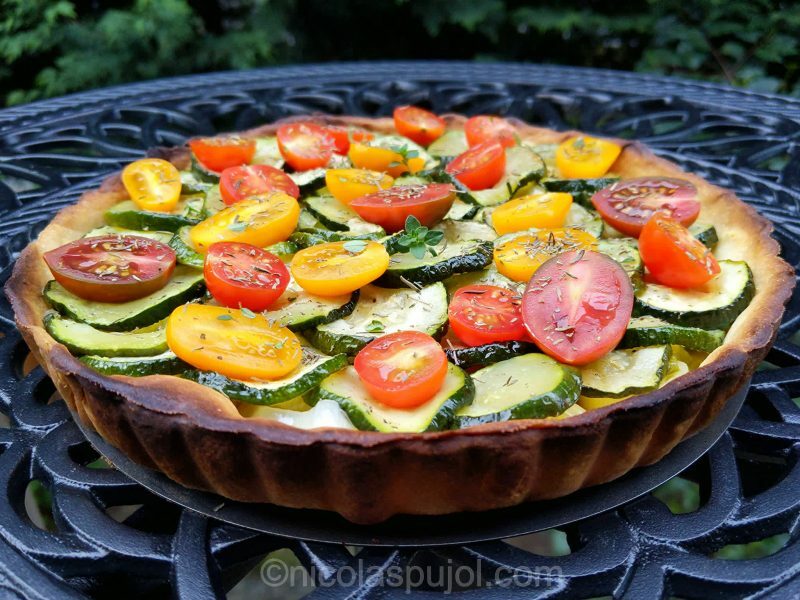 The fourth tart is this easy recipe, which she was not planning to post. 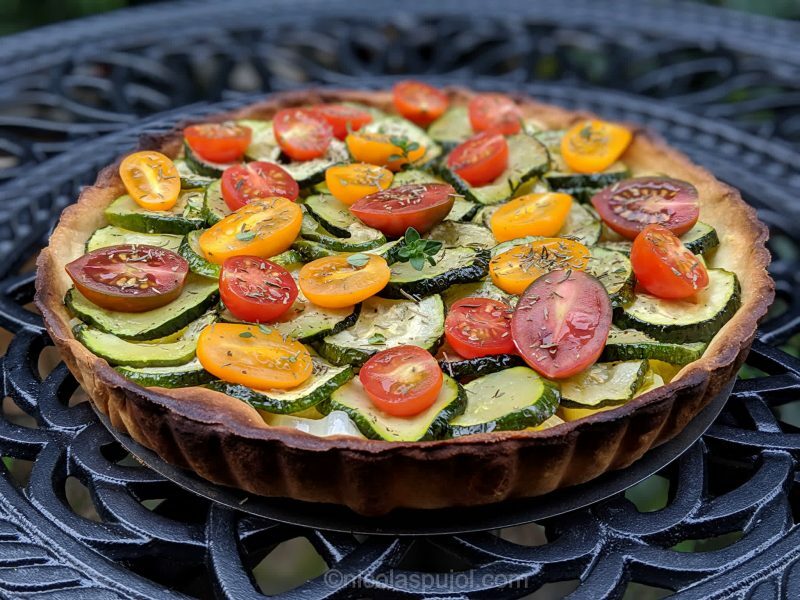 But I found this tart so perfect that we decided to share it on this blog. 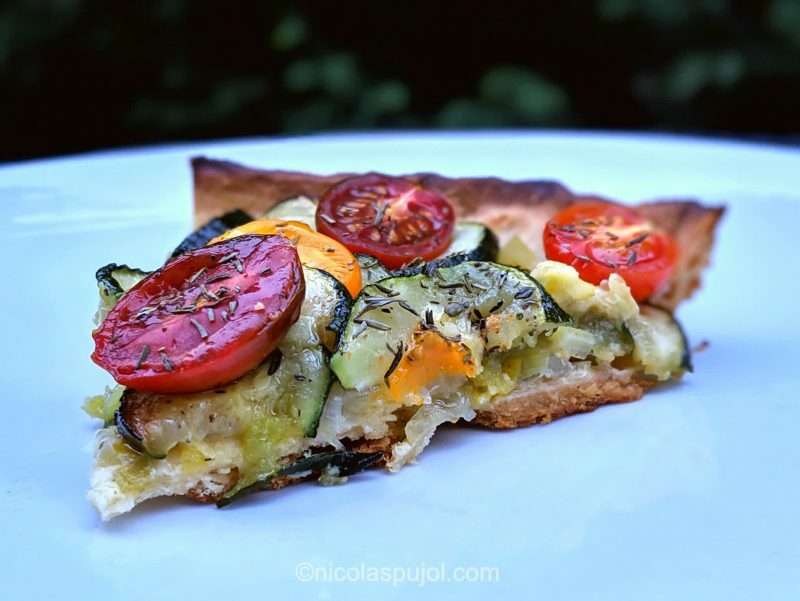 You can make this leek and zucchini tart using a classic dough, or a vegan dough. The rest of the ingredients contain no animal products, so this gives you the freedom to adapt the recipe. For tonight we used a classic dough. Eating a plant-based diet can allow a few exceptions, this is one of them. There is something influential about the colors of a dish. 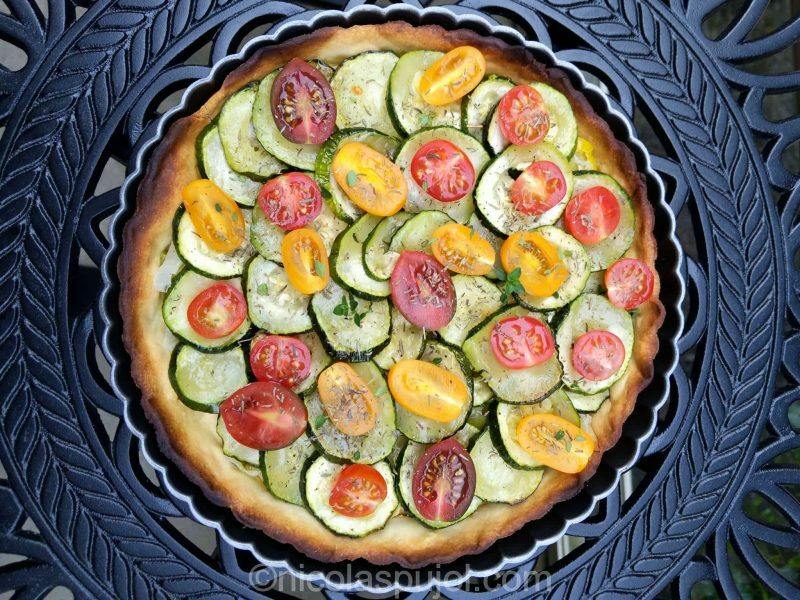 With a tart looking this colorful from the zucchinis, tomatoes and a perfectly baked dough, it makes the dish all the more appetizing. In terms of spices, the top has sprinkles of thyme. Our family being a fan of hot sauce, we each added the one we like the most: for Layla and Alex, sriracha, and for Marc and I, tabasco. Which hot sauce is your favorite? Are the flavors Latin, or more from Provence? I would say Provence, because of the thyme, olive oil and fresh vegetables. 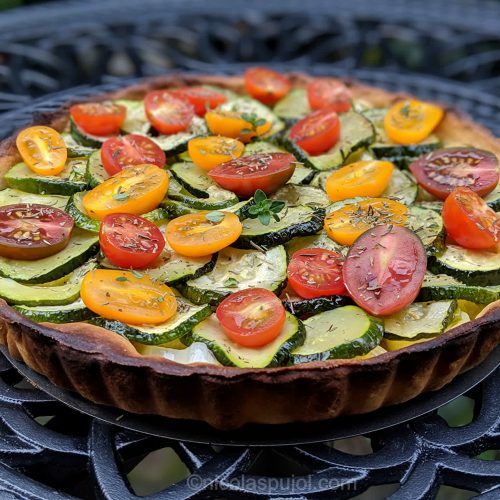 But nowadays dishes can take many origins, and if we follow this line of thought, this leek and zucchini tart is a recipe from Seattle. Make the tart dough or buy a pre-made one. Finely chop the leeks keeping only the white parts and sautee them in a pan for about 15 minutes with 2 tbsp of olive oil. Slice the zucchini, add 1 tbsp of oil and bake it for 15 minutes at 400 F heat. At the same time, place the dough in a tart mold (8 inches), cover with parchment paper and top with beads for a bit of weight. Add it into the oven, side by side with the zucchinis. This will pre-bake the tart dough without burning it. Remove the dough, beads and parchment paper on top. Spread the mustard onto the dough. Add in the sauteed leeks, then the zucchini slices, tomatoes, 1 tbsp olive oil, and fresh thyme or herbs. Bake for another 15 minutes at 375 F.